Since its foundation during the Gothic Era, historical layers progressively fragmented Lesser Town Square in two distinct areas on each side of St Nicholas’ church : the upper Lesser Town where stands the Prague Column of the Holy Trinity, and the lower Lesser Town where the tramway stops. Its situation in the very heart of the city slowly turned Lesser Town Square in both an obvious, easy to use parking area and a mandatory roundabout for the traffic flows through Lesser Town. Whereas the square holds a concentration of significant buildings (Malostranska beseda, Sternberg Palace, Smiřicky Palace, Charles University and the Academy of Performing Arts in Prague…), its lack of open public space represent a serious drawbacks regarding its cultural and historical representation. Our urban and architectural proposal intends to reduce traffic congestion in order to reconcile Lesser Town Square with its former state of public life representation. We believe that an intervention on this Square must highlight the rich cultural and architectural background of its surroundings so that Lesser Town Square regains its original urban character as a medium for the public expression, a container of activities, matching the scale of a stimulating European capital such as Prague. • Implementing a new circulation scheme around the church, by allowing a two-way traffic on the lower side and saving the existing one-way road on the upper side exclusively for the uses of buses and taxis. • Optimizing the use of public transportation by creating more functional spaces for each of the existing means of transportation : the tramway station, two minibus station for line 292 (one for tramway transfer and the other on the upper side of the square), and waiting areas dedicated to taxis apart from the busy Malostranské náměstí. 1. In the short term, it will reduce the volume of existing parking spaces on the lower side of the square, removing visitor’s parking spaces and replacing them by at least 46 spaces dedicated to the Parliament. 2. On a longer term, the proposal suggests to entirely free the upper side of the square from parking spaces or any other private occupation. All the residents’ parking spaces (the blue zone) will be therefore moved to the lower side where the new parking was hosting the Parliament spaces. • Gathering together the two sides of the square through topographical continuity. Good pedestrian accessibility, adapted furnishing and efficient signage are mandatory elements to encourage the use of alternative transportation methods such as biking, or simply walking ! • Establishing suitable commercial and flexible exhibition spaces. On the lower side of the square, newspaper kiosk and a flower stand will be permanently installed. However the upper part, freed from traffic and parking spaces, will be totally dedicated to flexible uses, one-off activities such as outdoor movie projection, acting stages, art exhibitions, or Christmas market… as a way for the new place to receive activities from both the city at its entire scale and from the Universities around Lesser Town Square. 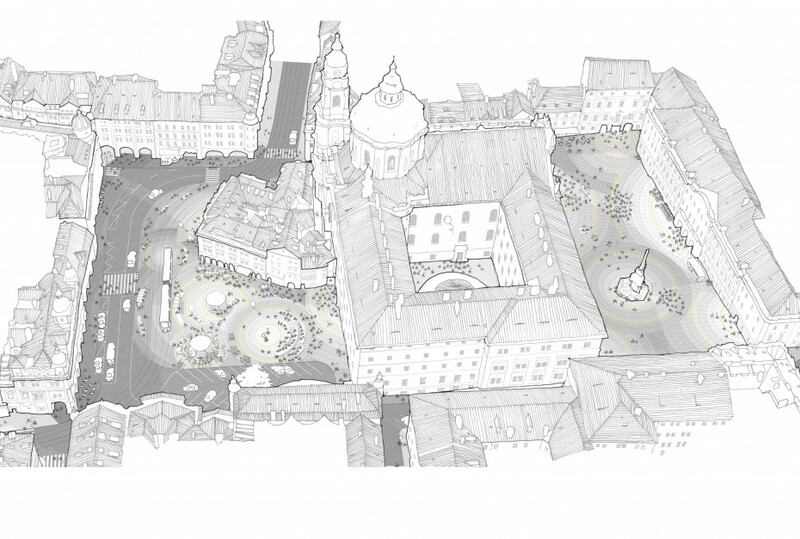 • Eventually, referring to Alfons Mucha’s renowned Arts Nouveau illustrations, the geometrical shapes of the project allow a global perception of Lesser Town Square as a reunited, fully-fledged public space for the Prague citizens and foreigners. • This unity of the Square will be also emphasized by the use of colored precast concrete panels matching the needs of flexibility and allowing the installation of contemporary furnishing.